The Netherbow name was adopted by a near by building incoporating a theatre, café, storytelling and arts centre. 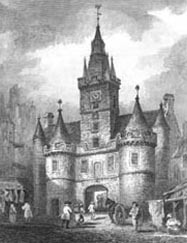 The Netherbow Port was a large gatehouse between the High Street and the Canongate. 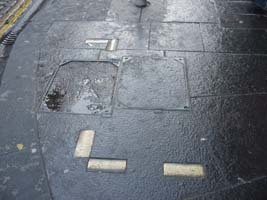 The gates along with the old city wall enclosed the city and citizens from the Canongate and beyond would have to pay to gain entry. Poorer residents within the city couldn't leave as they couldn't afford to pay to re-enter and so stayed withinin the walled city their whole lives. The area inside the Netherbow gate became known as the World's end because for many residents this was where their world ended. 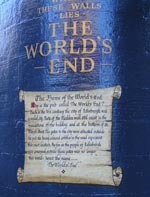 and a pub in this location is so called The World's End. 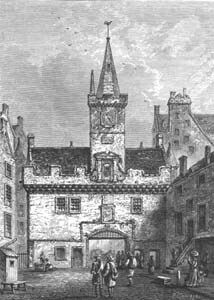 The Gate had impressive towers and the heads of executed prisoners from the Old Tolbooth were ofter displayed on the spikes of the Netherbow Gate to deter would-be criminals. It was demolished in 1764 but is depicted in the sign for the Netherbow Theatre (above) and brass clobbles on the road mark the outline of the old gate perimeter.